The two littlest Vikings are getting bigger and stronger and wilder every day. Nothing scares them at all and that worries Knut no end. Josh loves all things Viking – so much so that he prefers to be called Knut, Prince of the Vikings. Hardly anything scares him, except perhaps his little twin siblings, who get into everything and don’t seem to be scared of anything. When Nan and Pop take the family to Viking World, a theme park, the twins’ adventurous antics will land them in a whole lot of trouble, which only Josh can save them from. In the meantime, up in Asgard, the Norse Gods have their eye on Knut and the twns. When Thor decides to head down to Viking World, he leaves his friends unprotected. Josh’s actions down below could unwittingly help out his unearthly friends. The Last Viking Returns is a sequel to the popular The Last Viking,though it stands comfortably on its own. There’s plenty of humour and action, and the twin plot lines mean this will appeal to readers well into the school years. The illustrations, using pencil and digital watercolour, are rich and detailed, and the endpapers include a map of the theme park, and a code in runes. I was on a plane from Sydney to Perth to see my parents, but it was much more than just a flight west. It would eventually take me back more than thirty years, all the way back to Vietnam, back to a time when my parents were young and brave and desperate. Desperate enough to get on a leaky boat. In 2012 a break from her Sydney-based media career to visit her parents made Tracy Vo realise how homesick she was. It was time to move home to Perth. Ultimately, this decision took her much further, on a journey of discovery into her parents’ past. Thirty four years earlier, they had fled post-war Vietnam in a leaky boat, making a new life in Australia, where Tracy and her b=older brother Trevor were born and grew up. 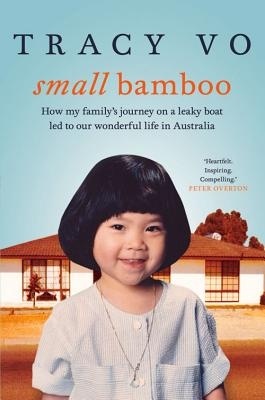 Small Bamboo is a captivating account of the Vo family’s life in Vietnam prior to and during the Vietnam war, their subsequent escape and journey to Australia, and their lives adapting to this new country. Vo also shares her own experiences as the child of refugee parents, and charts her career to date as a television and radio journalist. Readers will be entertained and intrigued by this glimpse into one family’s lives, and also witness to the way that hard work and determination can overcome adversity and lead to success. In a rusty Holden ute. And bundled it up in the boot. When the croc and platypus head outback in their dinky-di Aussie ute, they – and readers – are guaranteed an adventure. 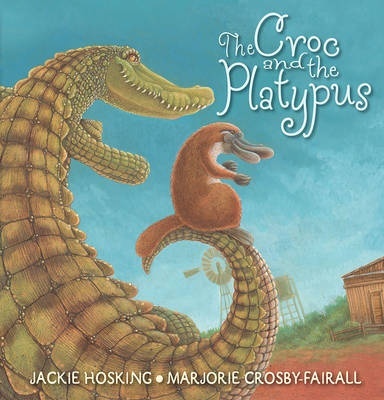 Using the rhythm of Edward Lear’s The Owl and The Pussycat, The Croc and the Platypus offers an Australian version which takes in many iconic Aussie images – including the ute, Uluru, lamingtons and, of course, the animals. This is a lively, humorous take on the original, though it isn’t necessary for children to know the Lear version in order to enjoy the fun of this new. The mismatched couple, the ochre and aqua landscapes and the fun of the word choices all make for loads of fun. Debut author Jackie Hosking makes rhyme look easy, and illustrator Marjorie Crosby-Fairall’s acrylic and pencil illustrations are a perfect complement. Delightful fun for Aussies of all ages. Claire tried to open her eyes. Blinding light. Pain shot through her temple. She touched her head with her fingertips. It felt warm and sticky. When her much loved grandmother is ill in hospital, Claire finds a old brooch among her things. It isn’t like her other, expensive jewellery – instead it is a cheap sequin star. Intrigued, Claire puts the brooch in her pocket and when she is in an accident soon afterwards, finds herself swept back in time to 1932. Claire is stranded in a circus camp, working hard and befriending circus performers Rosina and Jem, as well as a boy called Kit who, Claire realises, is her grandfather as a young man. Rosina and Kit are soon quite taken by each other, but Claire wonders whether a rich boy and a circus girl belong together – and what of her grandmother? 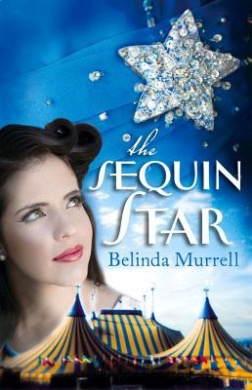 The Sequin Star is an exciting time-slip adventure set amidst the back drop of the Great Depression in the weeks around the opening of the Sydney Harbour Bridge. Claire’s adventures allow young readers to get a first-hand, modern perspective on both the events and on the contrasts between that time period and the contemporary world. Likely to appeal to middle and upper primary aged readers. This time Meilin didn’t run, She just didn’t have the energy anymore. But she walked fast, ignoring her hunger pains and rasping throat, the heat and the humidity. “I will find a way out,: she whispered. “I will get to Zhong. I will fight the Devourer and our enemies. But against that, there was a small voice in her head that whispered a hopeless, constantly repeating thought. I’m going to die. I’m lost and I’m going to die. Meilin is lost in a bamboo maze, regretting leaving the rest of the group, and wondering if she’ll ever see them again. The other young Greencloaks are searching for the next talisman, that of Dinesh, the great elephant. But there are enemies everywhere. The Conquerors want to destroy the balance between humans, animals and the spirit world, and Conor, Abeke, Rollan and Meilin will need to work together if they have any chance. 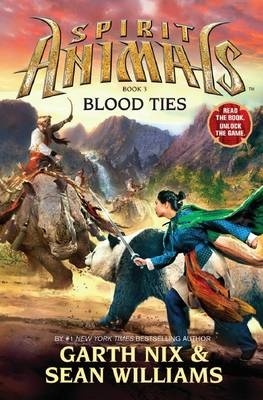 Blood Ties is the third title in the Spirit Animals series following four young heroes as they try to save Erdas. It stands on its own reasonably well, with enough back story filled in to make sense both of what happens and what has gone before, but is most suitable for readers who have read the first two. Plenty of action, beasts both mystical and real, and a strong cast of characters make this likely to appeal to young fantasy and action lovers. Jessica’s mind was too busy for sleep. Her thoughts were already with tomorrow. And when tomorrow came, everybody was excited. Everyone in Jessica’s family is as excited about her first day at school as Jessica herself is. She is particularly excited about making lots of new friends. She takes her box with her to make sure of it. She knows that everyone will be as interested in sharing her box and its contents as she is. But school is a different place, and making friends isn’t as easy or automatic as she envisaged. A square hardback, ‘Jessica’s Box’ uses white space to echo Jessica’s initial silence as she tries to make friends. When she has their attention, the white space diminishes. When her efforts fail, the images fade to almost black and white. She keeps trying, but the results are not quite right, until she puts something extra special in the box. It works. Endpapers are a gentle sunny yellow and include a smaller version of the front cover image. The first day of school is a biggie. For some children, it’s a day that can’t come too soon. Others approach the changes that school will bring with trepidation, despite the best preparation. ‘Jessica’s Box’ shows a child keen to go to school, but with an underlying unspoken anxiety about how it will all go. So she takes a familiar object, her box. Her box can be anything that she wants it to be. She is sure that it will facilitate friendships. The responses to her box are varied and not as she expects. She is trying to ‘buy’ friendship with the contents of her box. Only when she stops trying, does she inadvertently discover all she needs to make friends is herself. Recommended for pre-school to early-primary children, particularly those approaching school-age. This new edition of ‘Jessica’s Box’ has an identical text to the original, but Jessica is shown in a wheelchair throughout. There is a dust jacket and the cover is pale green, rather than white. The publication is supported by Cerebral Palsy Alliance. Jessica’s disability is irrelevant to the story and is not mentioned at all. Plenty of opportunity for classroom discussion at many levels about the decision to re-release ‘Jessica’s Box’ with these new illustrations. Plenty of room for discussion about the depiction of disability in literature. Recommended for pre-schoolers, early-primary and beyond. “I can call you back later?’ Dr Becker, the Head Geneticist at the Hereditary Cancer Clinic, said. ‘No, no. It’s fine,’ I replied, eager to know what I’d just heard about a cancer gene was correct. Tanya Saad hadn’t heard of the BRCA 1 gene until a family study revealed that her father was a carrier, and that many female relatives had died prematurely from breast or cervical cancer. When tests revealed that she too had the gene, her life changed irrevocably. Decisions had to be made about how to confront this news – whether to have difficult preventative surgery, or to rely on regular testing t pick up early signs of cancer, if she should develop it. The fact that one of her two sisters also tested positive added an extra challenge. As she navigated her way through these challenges, Tanya also revisited her childhood and her heritage, as well as reassessing her future. From The Feet Up is an honest, personal account of one woman’s journey through a complex health issue. Blending the exploration of her experience with BRCA1, including the decision to have a preventative mastectomy with a memoir of her experiences as a Lebanese child growing up in a country town, her sporting career and her family life, makes for a complex and rich story. Leroy has a problem, and it’s a big one. There’s a bully on his school bus – and she’s bigger than him, bigger than his sister Ruby, even as big as his mum. DJ goes to the high school, but she doesn’t want to be there. Leroy likes school, but he doesn’t like the bus, especially when DJ is on it. Leroy needs a secret weapon, but when he finds it he wonders if it will be enough to silence the bully. Bully on the Bus is a gorgeous new verse novel for younger readers. Leroy and his family are realistic and well-drawn, as is the situation he finds himself in. The resolution, too, is clever, and shows Leroy drawing on the help of those around him but, ultimately, being key to fixing the problem. This is Apel‘s first foray into the verse novel form, but hopefully it won’t be her last. She handles it deftly and with sensitivity. …there were far more brutal places than Changi. While the stories of the suffering and survival of Australians at Changi, the biggest prisoner of war camp on Singapore island, are well known, the stories of Outram Road Gaol are far less so. This was where escapees and traitors were sent, including allied prisoners of war as well as Chinese civilians and even Japanese soldiers. It is estimated that thousands of people died here, many executed, others of malnutrition or disease. Stubborn Buggers tells the stories of twelve Australian prisoners of war and their experiences in Outram Road Gaol as well as on the Thai-Burma Railway and Sandakan. It is not an easy to read book, because of its subject matter, but it is compelling, sharing not just facts, but stories of survival and perseverance, even humour. Drawing on extensive interviews with the survivors, this is a moving and important look at a dark piece of history. They retraced their steps, but before they had gone more than a few chang, there was a disturbance in the forest. It was the same sound that they had heard near Shenchi village – branches breaking, undergrowth being flattened, the thud of large feet. There was also an unholy screech that made Tao’s insides turn to water. Below them, the nomads had also heard the noise and were picking up their weapons. Whatever was causing this disturbance was getting closer. Tao’s instinct was to run, but Kai stopped him. Since he left the monastery to travel with Kai, Tao has tried hard to learn the skills of the dragonkeeper, but it is not easy. He has no-one to teach him what to do, and he is yet to discover his special qi power. His journey with Kai is long and complex – he has to trust Kai that they are heading in the right direction. There are also many perils – a gang of violent nomads who will stop at nothing to get what they want, a ferocious seven-headed snake-beast, and a ghost who wants to freeze Tao’s blood. 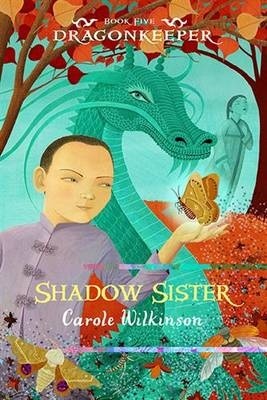 Shadow Sister is the fifth book in the stunning Dragonkeeper series, and maintains the quality of its predecessors. Wilkinson’s characters are endearing – or frightful, in the case of enemies including Fo Tu Deng and Filong – and the settings well-painted. The action is finely paced, keeping the reader engrossed from beginning to end. As with other books in the series, Shadow Sister could be read alone, but readers who have read the other titles will be glad they have, and those who haven’t will find themselves drawn to seek them out.